Here's another easy way to shoot a video for the web. Well, it's relatively easy. In this example you don't need a video camera. Just a still digital camera that can take time-lapse photos. For this project I took my Macintosh PowerBook and Canon S400 out into the yard. I attached the S400 up to a tripod and then connected it to the PowerBook via a USB cable. The Canon camera comes with softwware that allows you to take time-lapse photos, it's called Remote Capture. I set the camera up facing the garden, and then entered in settings to tell the camera to take one photo every 10 seconds. I stored the photos on the PowerBook in a folder. Then I planted the garden. Every 10 seconds the camera took a picture. After the garden was complete, I stopped the time-lapse. The elapsed time was about 45 minutes and the camera took 169 photos. There was about 80 errors, where photos were not taken. I'm not sure yet why that happened. Next, I opened Final Cut Pro and imported the whole folder of photos. Then I dragged a few onto the timeline to see how they would look. Each one was given a default time of ten seconds. That's too long. It would have made a movie that was 28 minutes long. So I reset Final Cut Pro to make the default still frame one second. You've got to re-import your photos to get the new default applied. Then I put all the photos on the timeline and added music. Next, you've got to export and compress your movie for the web. I use Sorenson Squeeze, but you could use Compressor which is included in FCP. I made the movie a small size 1.2 MB, which makes is less clear, but allows dial up users the ability to view it, and won't use up as much bandwidth. I played the movie locally to check it out. After that, I edited my HTML template and uploaded the template and the QuickTime .mov file to my host. Then I loaded the new page into my browser and played the movie again to see how it played over the net. 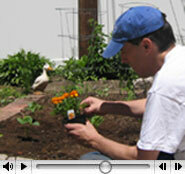 I stopped it on an interesting frame and took a screen capture so I could use that image on my video blog post. Finally, I went into TypePad and wrote the post that points to my HTML page where the video is hosted. I inserted the image and posted the entry. Once you've done it a few times it's not that bad. It would be great if TypePad could add push-button features that took away all the HTML creation and FTP file transfer procedure. Until then, I'll continue doing it by hand.